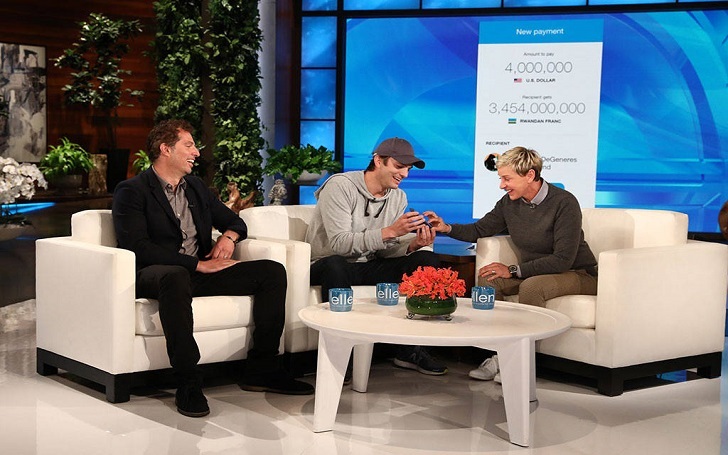 Ashton Kutcher, an actor and venture capitalist, appeared on The Ellen DeGeneres Show with his investment partner, Guy Oseary, on Wednesday, May 23 and the 40-year-old investor took San Francisco-based cryptocurrency firm XRP (Ripple) to surprise Ellen DeGeneres with the donation of $4 million to the Ellen DeGeneres Wildlife Fund. Wow! The daytime talk show host's 60th birthday has already been passed back in January, but the gifts keep on coming. During the show, the co-founder of VC firm Sound Ventures explained that they had concocted the plan during a recent investor meeting. We [told Ripple], there’s this amazing human being and all they ever do is think about other people they can give to. Whether it’s in New Orleans, whether it’s in Montecito, whether it’s the people that come here, the people out there, you’re always thinking about everyone else and we wanted to show you that people are thinking about you. Ashton, who confirmed that Sound Ventures is investing in Ripple, made the transaction on the air using an XRP payment app. He further highlighted the cryptocurrency’s ability to promote near-instant cross-border transactions. Now, usually people come out with a big giant check and do the ‘big giant check thing’, but we can transfer it into Rwandan Francs right now right here, and all you need to do is push this button. Ellen also teared up back in February when Portia de Rossi appeared on the show and present her wife with the gift of The Ellen DeGeneres Wildlife Fund. For your birthday, Ellen, I am bringing you and your hero, Dian [Fossey], together by building the Ellen DeGeneres Campus of the Dian Fossey Gorilla Fund. Ellen, you will carry on Dian's legacy by giving them a permanent home in Rwanda. Now, you will join Dian as a protector and champion of these amazing animals, the mountain gorillas. Happy birthday! It’s the best gift," she said through tears. "I’ve always said -- and when we got married, Portia’s line was, 'It’s good to be loved; it’s profound to be understood' -- and, she understands me because that is the best gift that anybody could have given me. So, I love you. The couple was married in Beverly Hills, California based home in August 2008. Only 17 guests and their mothers attended the lesbian couple's wedding ceremony.